Activists are confronting a San Francisco event space with a self-proclaimed "social justice" mission over gentrification and its owner’s outspoken Zionism. When Emanuel “Manny” Yekutiel opened his events space and wine bar in San Francisco last December, he didn’t expect his self-named business, Manny’s, to become an example of how not to launch a successful startup in Silicon Valley. However, activists with roots in the neighborhood — who have protested outside Manny’s every Wednesday night since it opened its doors — believe its mission is just a way of dressing up the ugly truth around the politics of the place. In their eyes, it’s a business that further gentrifies a neighborhood where evictions and homelessness are increasing, with an owner who supports Zionism — the nationalist movement in Israel that props up the occupation of Palestine. In the progressive Bay Area, activists have a term for the feel-good, liberal marketing behind Manny’s: “woke-washing,” which they define as an attempt to paint a liberal face on a business that supports right-wing political views. Jemma lives several blocks away from Manny’s in San Francisco’s Mission District — a neighborhood often dubbed “ground zero” by the mainstream media, when it talks about the issue of housing inequality. She requested her last name not be used because she works for the government, which is continuously threatening free speech — and specifically targeting those who support the boycott, divestment and sanctions, or BDS, movement against Israel. Jemma says the portraits of black people displayed prominently on the walls of Manny’s are an attempt to make the place seem “woke,” but it’s just a facade. “It’s the equivalent of liberal blackface,” she said. The gentrification leads to increased police violence in a once majority-Latinx neighborhood. Jemma is a regular organizer with queer direct action groups concerned with the ousting of black and low-income people from the Bay Area, such as the Lucy Parsons Project and Gay Shame. She says that at its base, the boycott of Manny’s appeals to a basic human desire: No one wants to feel like they’re being taken advantage of. All of these groups agree on the importance of intersectionality in movements: Oppression is oppression, no matter where it happens in the world. The boycott has so far led several speakers to cancel planned events at Manny’s, including labor organizer Ai-jen Poo of the Domestic Workers Alliance and the hip hop and politics radio show host Davey D.
Why focus on Manny’s? To locals on the left, the venue’s “social justice”-messaging represents an insidious form of “faux-gressivism” that skirts, and sometimes makes worse, current political flashpoints. Gentrification, for starters, intensifies homelessness and police killings. And the extraordinary ties between the United States and Israel form a messy knot, involving billions in military aid each year, and American police traveling to Israel for training. A January job posting on Craigslist described Yekutiel’s belief “in investing in our people and our culture.” After a social media call-out by Gay Shame, the job’s terms — specifically, a minimum-wage salary with fewer hours than would legally compel the company to offer health insurance — were deleted. 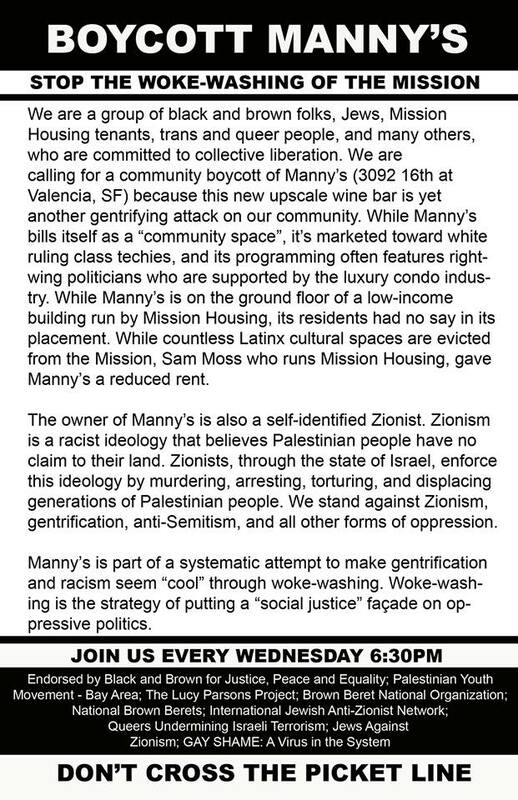 A low-income housing nonprofit is the landlord of Manny’s, which offered Yekutiel below-market rate rent because of the wine bar’s supposed social justice mission. 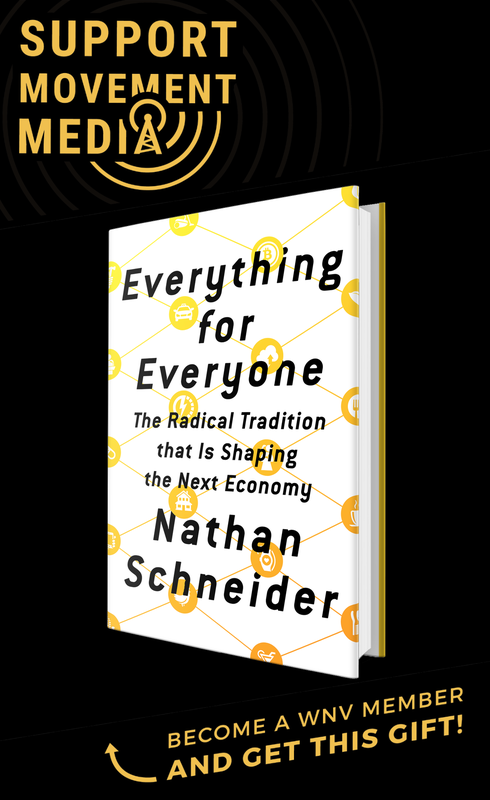 At the same time, many of Manny’s speakers don’t particularly bring to mind social justice — such as tech billionaire and influencer Sam Altman — whose defense of sexists and hypocrisy around free speech have helped to cement Silicon Valley’s toxic culture — or a staffer from the Burning Man arts festival, which can cost $1,000-$5,000 to attend. This has led many activists to believe that the community has less to gain from hearing these speakers than the speakers have to benefit from an association with a progressive-seeming event venue like Manny’s. “It’s basically a place for techies to feel good about themselves while black and brown people are dying in the streets,” Jemma said. Activists also point out how Yekutiel previously worked in public relations for the tech industry-funded charity FWD.us, which became infamous in left circles for funding advertisements with a right-wing — anti-immigrant and pro-oil — agenda. Before that, he worked as a fellow sponsored by the Israel lobby firm A Wider Bridge, a pinkwashing group whose right-wing funding was recently laid out in a February 2019 report by independent scholar Stephanie Skora, with support from the National Lawyers’ Guild, the Chicago chapter of Jewish Voice for Peace and the Canada-based Independent Jewish Voices. Yekutiel has not helped his cause by gaslighting activists and silencing people who have been hit the hardest by problems like unaffordable housing. In an op-ed for the San Francisco Chronicle, he dubbed activists like Jemma “the alt-left,” effectively equating nonviolent protesters with the white supremacist clashes that have literally killed anti-racist activists. As the protests approach month five, there is a widening coalition — including labor activists, students and hunger strikers who protested killer cops outside the police station a block from Manny’s — that believes a combination of leadership from people who are directly affected, persistent direct action and more BDS-inspired guest cancellations can beat the false liberal marketing of woke-washing.